I have some sad news to convey about the violent death of a member of the American botanical community. Jessica Orozco was a range scientist for the Hualapai tribe in northern Arizona. She received botanical training at San Francisco State University and Rancho Santa Ana Botanic Garden. I'm sure many of you knew Jessica, and this is tragic, difficult news to bear. She was an ethnobotanist with a passionate commitment to preserve Native American botanical knowledge. A very bright light whom we will miss. We will try to place information about memorial services and tributes below. If you have information you wish me to share with others, please pass it along to me (mark.fishbein@okstate.edu). The memorial fund in her honor is currently setting up a trust account under the name "Jessica Orozco Memorial Trust" with James, Jessica’s adopted son, named as the beneficiary. Danielle Black- A longtime friend of Jessica and James. Lucinda McDade- The program director at Jessica's graduate institution (Rancho Santa Ana Botanic Garden). Ingrid Jordan-Thaden- A fellow botany friend and colleague of Jessica. Any questions or concerns regarding trust can be directed to Danielle Black (danielle.black [at] gmail.com). The trustees intend to continue to make the process as transparent as possible for donors to this cause to support James and his future. 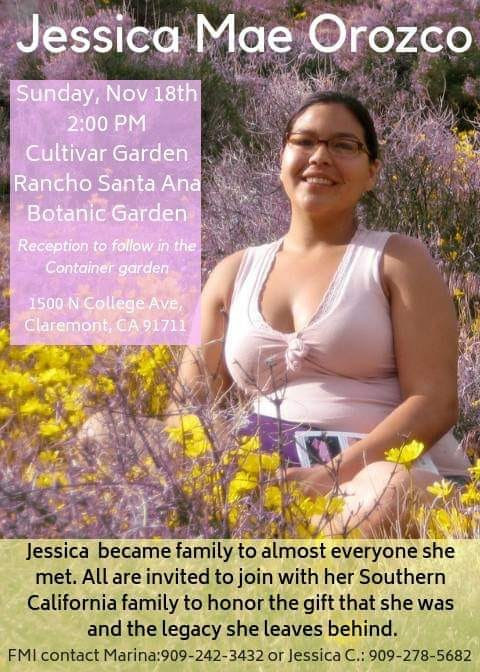 A memorial to Jessica was held at the Rancho Santa Ana Botanic Garden on Sunday, Nov. 18th. A previous memorial for Jessica was held at the Hualapai Tribal Gymnasium in Peach Springs, AZ on Friday, Nov. 2nd. She was laid to rest at Our Lady of Sorrows Cemetery in Reno, NV. Jessica Mae Orozco was taken from us Oct. 27, 2018 at the age of 31. She was born Feb. 1, 1987 in Sacramento, California. She received a Master of Science in Botany from Claremont Graduate University, and a Bachelor of Science degree in Plant Biology from San Francisco State University. She also minored in American Indian Studies at SFSU, and had been working her dream job as a Range Specialist with the Natural Resources Department. Jessica Orozco was a proud Native woman who was able to take all of the anguish and pain of the past and transform it into a beautiful life, where she fought for the rights of the indigenous and refused to submit to the lasting effects of colonization. Jessica had an unprecedented love and understanding of the earth and all its plants. The joy she felt in discovering plants unknown to her, or in teaching others about plants unknown to them, was a joy that would resonate in everyone around her. Jessica developed her love for nature at an early age. As a botanist, she trudged through paths less traveled in order to shine light on plants that would have otherwise been overlooked. She truly was a gift to Mother Earth. Jessica is survived by her uncle, Shawn Gaskins, sister, Kelly Rose Clayton, and nephew, James Kitchens. She loved her nephew James more than anything in the world. When the time came for James to need a parent, Jessica overnight became an amazing, committed single mom whose life was so enriched by her courageous decision. She commonly referred to him as her “heart.” She felt a strong need to protect her “heart,” and had been his legal guardian since 2015. Jessica was also in a very loving relationship with Brandon Havatone and often expressed how happy she was with their life together. She loved her cowboy so much. She found her home here within the Hualapai community and was so excited to establish roots here and watch them grow. No matter how much time anyone spent with Jessica, she always left an impression. Her bright, bubbly, and exciting nature could fill any room with laughter and smiles. She had the most positive energy and had been practicing Buddhism where she was able to foster that energy and share it with others. Through her studies, work, and adventures, Jessica encountered so many people and touched so many lives. It is immensely tragic to have such a beautiful soul stolen from the world by such a senseless act. She had spent her life dedicated to the purpose of helping the planet heal, and there was so much more she had planned to do. Forever in our hearts, our minds, and within the energy of plants. Jessica Mae Orozco, you will be missed.